Too many people are trying to make the web more usable so I thought I’d try the opposite. Below are some user interface elements I designed to confuse, badger, and infuriate users. Enjoy. Part checkbox, part button. Ideally this will initially present itself in the “checked” state, regardless of user intent. Functions as a regular checkbox, but activating the slider simply covers up the checkbox and label. Avoid action-oriented labels such as OK or YES, and instead use vague language and/or the past tense. 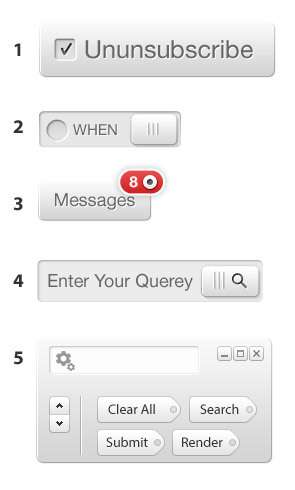 Displays the number of notifications alongside an active radio button. Clicking or tapping on the radio button immediately marks all the notifications as “read”. A standard text entry field, but the user must slide the search button to the left to submit the form. As the search button slides, it deletes the characters it touches. This UI element has everything; pre-populated tags that are confusingly named, 2 scroll buttons, a search field with a settings icon, and Windows controls that do nothing! I’ve also made the PSD available for download. Please use irresponsibly.